Christiaan and Hanrie bring with them a diverse background of experience, both in and out of the water. Both born in South Africa and having lived all over the world, from Bangkok, to Spain, New York and Madagascar, doing everything from working in the hospitality industry, acting, travel writing, teaching English, running surf charters in Madagascar and working on mega yachts, both eventually fell in love with the Caribbean, and have been running charters as Captain and Chef/ Mate team for the past 4 years. High school sweet hearts since the age of 16, Christiaan and Hanrie effortlessly work together to provide all of their guests with a tailor-made memorable holiday experience that makes them come back again and again for another rum punch or painkiller under the Caribbean sun. Captain Christiaan is a born entertainer, hence the brief stint in acting, and enjoys telling tall tales of pirate lure and big fish and the one that got away. His good natured bubbly spirit and can-do attitude put guests at ease while his professionalism and ability to command a variety of situations instill confidence. Christiaan’s knowledge of the best Caribbean anchorages will ensure that you will be sipping your cocktail on the fly bridge of Dragonfly with the best sunset views, and his love for watersports and tall tales will ensure you will never be bored! Hanrie honed her cooking skills at a young age begging to make family dinners since the age of 9. Ever since then she has been baking and cooking and soaking up all of the local flavors and food inspiration wherever she has gone. Hanrie has a varied cooking style, from Mediterranean, Thai, French, Peruvian, Caribbean, South African and American, with a focus on healthy locally sourced products and produce. With over 4 years’ experience in different roles on boats, from 48 ft to 160 ft, you can be ensured that all your needs will be taken care of and that all of your senses will be engaged at each meal time dinning on the aft deck of Dragonfly! 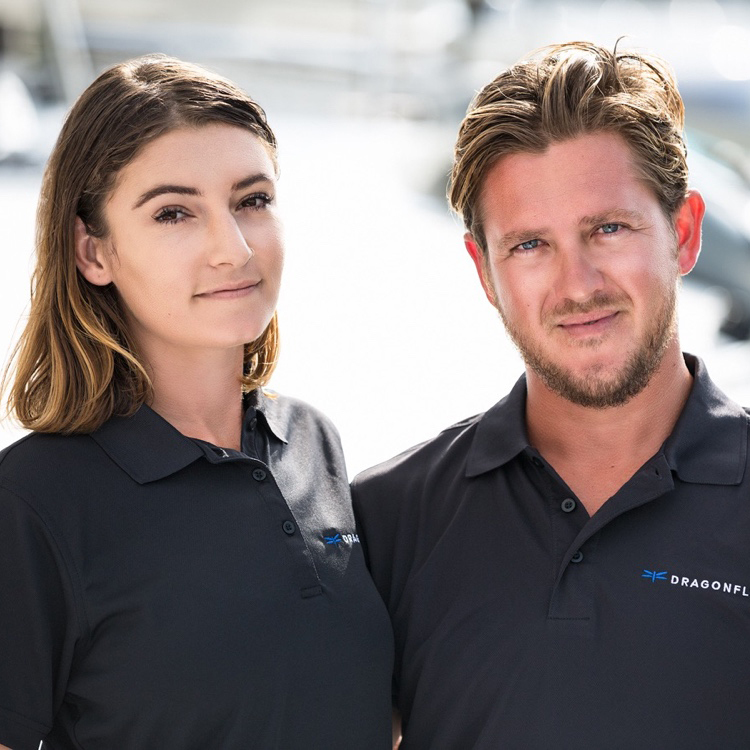 With their warm and personable, yet professional personalities Christiaan and Hanrie pride themselves on making every trip onboard Dragonfly and utterly unforgettable one for all of their guests! “Where to begin? We came here to celebrate friendship and 50th birthdays and came away with so much more! From the very beginning your easy going and fun personalities combined with your expertise and professionalism made for a wonderful week. Although at 50 we are all feeling a bit under accomplished after listening to all of your incredible adventures. Hanrie, you are a true gourmet: the variety and presentation of every meal was 5 star! “To my Ninja Pirates: Thank you thank you thank you! You two have made this trip truly a trip of a lifetime! Christiaan, thank you for showing us some amazing places and for being VERY patient with us all! Also thank you for showing me how to paddle board. I will miss the sun calls and will try to practice them for next time! Hanrie, you, my dear, are an amazing chef! I will miss the daily meals and wish I could pack you in my suitcase! “ What an amazing trip! When we first boarded we where blown away by how beautiful the boat was, down to every last detail. We very soon realized that we would all be 10lbs heavier after eating every delicious meal Hanrie crafted for us. Her cooking is world class and we have enjoyed every last bit of it!Christiaan was an amazing skipper. Fun loving but also always taking us to the best and most beautiful spots. You truly know you are in great hands. “ Where to start? When we started this adventure we had expectations, assumptions and hopes for what our week would offer and we can say that not only where our hopes met, they were far surpassed!! Christiaan, your outgoing, charismatic personality is endearing! Your Knowledge of the BVI is impressive and your bartending skills thoroughly enjoyed! We so enjoyed listening to your stories and music! Hanrie- where to even begin with your chef skils! They say that meals are first eaten with your eyes, and if this is true, we were fulfilled twice at each meal. Your dishes where just as beautiful as they where delicious. You have inspired me to try to step it up at home!